Outfit your deck, garden, or poolside deck in simple, elegant style! Browse our high-quality outdoor patio furniture online! We work with renowned designers to bring you the most beautiful collections at reasonable prices. Whether you need a teak wood accent piece for your patio or are designing an entirely new outdoor entertainment center, we're sure you'll find what you need at AquaTeak®. Front Slide Extension Tables with a simple slide-mechanism developed in Germany. Whether you are entertaining two or ten, our large front-slide tables are a great choice. Mixed-material furniture with high-grade #304 stainless steel that resists oxidation and rust for years of enjoyment. High-quality fabrics including durable, fade-resistant Batyline & long-lasting Sunbrella & Sunproof. 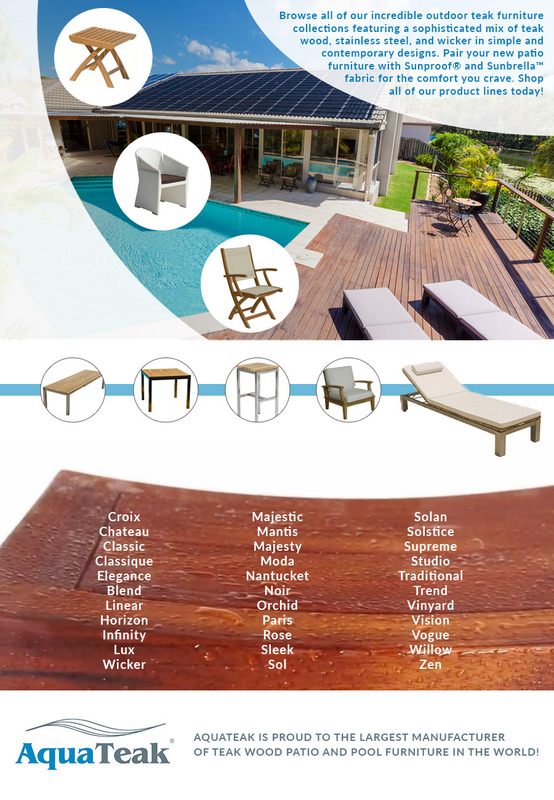 An entire line of solid, reclaimed teak patio furniture. In addition to beautiful furniture including sectionals, sofas, dining tables, loungers, & chairs, we've got all of the accessories you'll need for your outdoor pace including coordinated storage chest, planters, serving trays, trolleys, sunshades, & parasols! Our contemporary outdoor furniture is provided directly from the factory to you, with no middle man. We do not sell this contemporary outdoor furniture through retail channels, and can provide you with the equivalent of factory direct wholesale pricing. Average delivery time is 3-4 months from your order. After weeks of surfing the Web for high end, contemporary patio furniture, I happened to stumble upon the AquaTeak site... The furniture manufactured by AquaTeak looked fantastic on line, actually solid and beautiful, and very reasonably priced. So I contacted AquaTeak in November and explained that I was hosting a wedding in early February and wanted to order the furniture so it would arrive on time for the event. AquaTeak immediately got in touch with their contact in Indonesia who promised us the furniture in time for the wedding. I ordered the furniture; Howard and Amy did everything possible to keep me regularly posted on the status of my order. My elegant teak table and white sling chairs arrived in January, about three weeks before the wedding. The furniture was very well packaged. The table required some assembly, but it wasn't a difficult task. The table and chairs look as slick on my terrace as they do on the site that displays them. I receive compliments from everyone who sees the furniture. Some of my friends will be ordering from AquaTeak. The prices cannot be beaten. We estimate that our furniture would retail for twice if not three times what we paid for it. The order process was safe and seamless. We made a 50% deposit up front and paid the balance upon receipt of furniture. We are delighted with our furniture and the service we received from the distributor and manufacturer. In the future, we expect to continue to do business with them. If you are interested in custom ordered contemporary outdoor furniture please contact us at 1-800-786-8669 or email info@aqua-art.com. You may also use the web form below. Please note the page number, and item number of the products you are interested in, and we will promptly respond with a quotation for you.